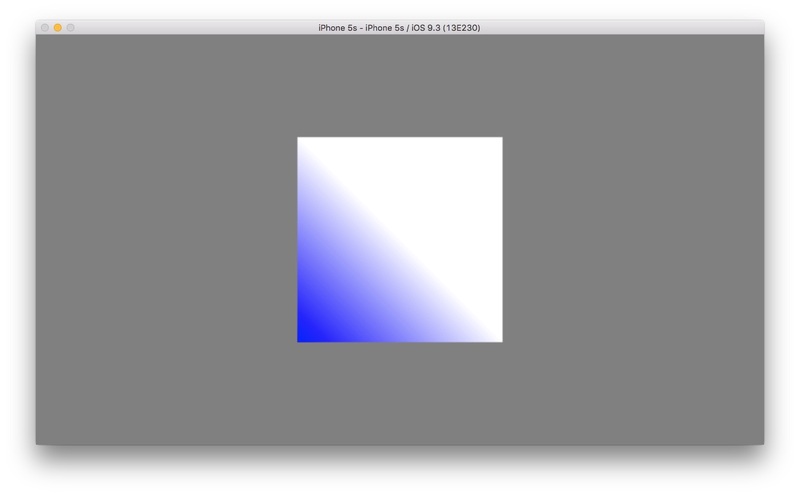 Once you get your first OpenGL view working on an iPhone or iPad, one of the first things you’ll likely notice is that when you rotate your device, the rendered image in that view stretches during the animated rotation of the display. This post explains why this happens, and what you can do to deal with it. Example code can be found at https://github.com/codefromabove/OpenGLDeviceRotation. In general, one can render to a portion of the image space by specifying a viewport that doesn’t encompass the entire image space, but in the sample code, we simply use (0, 0) as the viewport’s origin, and the UIView’s dimensions as the viewport’s width and height. In the example code, our sole object is a square — a triangle strip of two triangles –centered about the origin and going from -0.5 to 0.5 in X and Y (we don’t have Z values, so a Z = 0 is implied). // Set the projection to match the dimensions of the GL view. For landscape orientation, I want the square to be half the screen’s height, so I apply the same logic, with the X and Y directions reversing roles. Typically, in an iOS app one might set the viewport transform and projection transforms in viewWillLayoutSubviews, rather than in the render() method as we do in the sample code, but in any case, by the time the orientation transition is over, the rendered image of our square will be as intended (centered, and half the width in portrait, and half the height in landscape. But, even though we have the desired image in both orientations, the image during the transition will undergo an undesirable size and shape change, shown in the video above. Why is this? When our app was informed of the orientation change, it created a render buffer of the correct size and proportions, and when rendering we set up the viewport and projection matrices appropriately. Where is this distortion coming from? 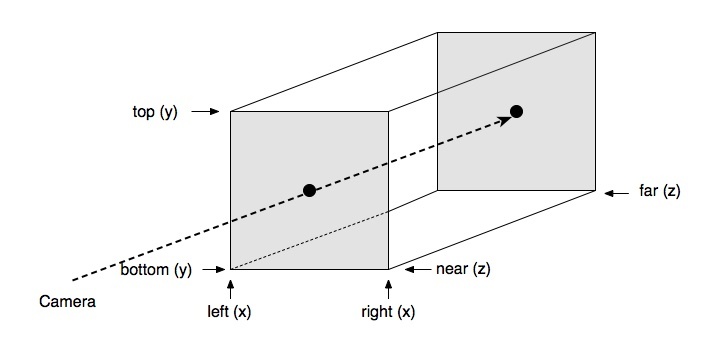 The notion that the stretching is “wrong” is based on the assumption what we see during the orientation change is a CALayer whose size and proportions match those of our underlying GLView. This assumption is, in fact, incorrect, and is the source of the problem. What we see during the transition is not simply a rotated version of our “final” GLView; instead, what we’re shown is a separate layer called the Presentation Layer. The Presentation Layer is (lazily) created by the underlying system software for the purpose of displaying animations of a view, including the animation of the rotating view. The Presentation Layer, during an orientation transition animation, changes size and proportions over the course of the rotation, and our rendered GLView’s image is displayed in this different-sized layer simply by scaling it to fit! This is the source of the image distortion — we’re seeing our scene with some non-uniform scaling applied to the displayed image. At the start of the rotation, the Presentation Layer is the same size and proportions as the GLView was before the orientation change, and at the end of the rotation, it has changed to the size and proportions of the GLView at the end of the rotation. Since we set up the render buffer, viewport, and orthographic transform to be correct for the GLView proportions at the end of the rotation, the scene looks correct at the end, but at the beginning it is highly stretched. 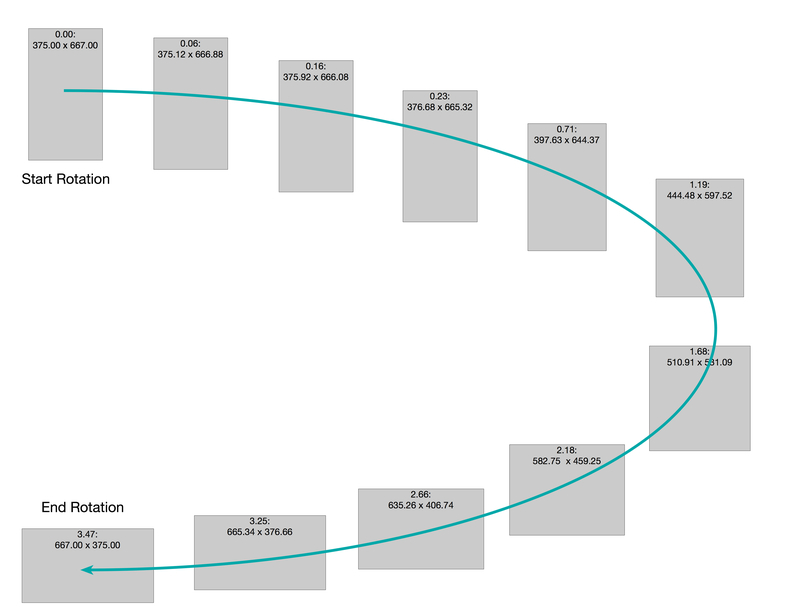 Let’s look at how the Presentation Layer changes during the transition. 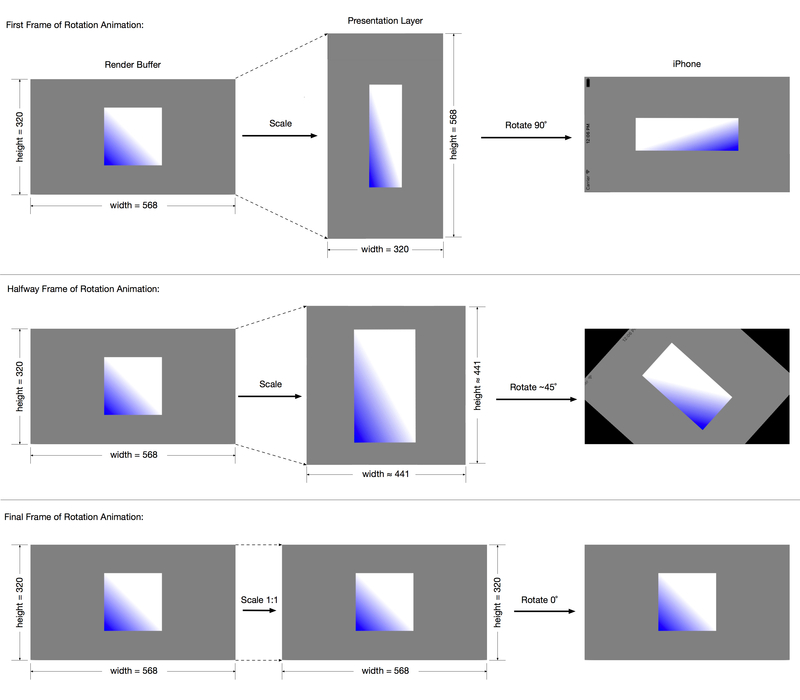 The diagram below shows the GL render buffer, the Presentation Layer, and the resulting iPhone display at the start, middle, and end of the rotation animation. 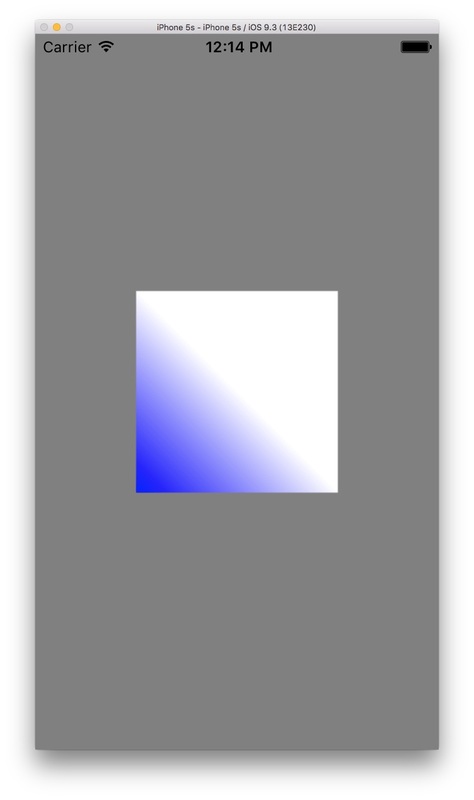 At the beginning of the rotation, the GL buffer is the same width and height as the GL view on the iPhone; however, the Presentation Layer’s width and height are the exact opposite. Since the GL buffer is displayed in the Presentation Layer, a nonuniform scaling is applied, and the layer is rotated 90˚ to the GL view. At the end of the rotation animation, the scaling of the GL buffer into the Presentation Layer is 1:1, and no rotation need be applied. About halfway through, the Presentation Layer is a square whose edges’ lengths are halfway between the lengths of the long and short edges of the GL buffer, and the Presentation Layer is rotated 45˚. 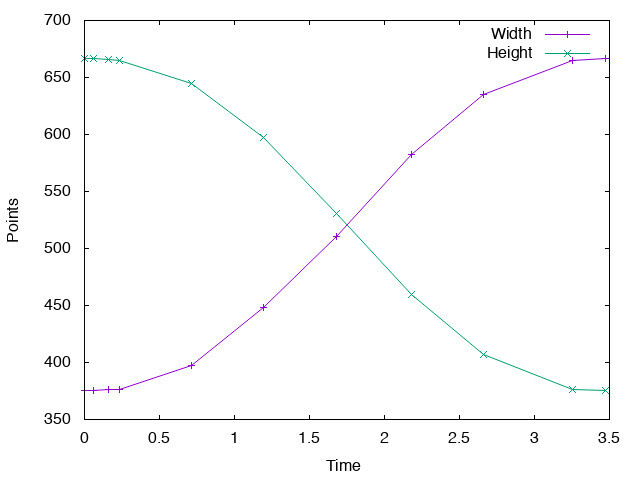 Note that the size and proportions don’t change linearly over time; rather, the graphs reflect a (typical) ease-in/ease-out animation curve for aesthetics. Recall this is called right before the orientation animation begins, so I set up a BOOL property “transitioning” to YES. I can know when the orientation animation is finished by completion block for animateAlongsideTransition, where I set it back to NO. So, when I get the call to viewWillLayoutSubviews or render, I can apply my solution for the distortion during the transition, or just use the “normal” code path otherwise. To get the desired results, one must first decide on the semantics of what one’s scene should look like in portrait, in landscape, and during the orientation transition. This is entirely application-dependent, so the precise details of my solution may not be what your application should do. But, armed with an understanding of what’s going on during the rotation animation, you should be able to come up with your application-specific solution. Recall that my desired semantics are that my square should be half the size of the smallest GLView (or screen) dimension, in both device orientations. For the transition, let’s say I want those same semantics. To compensate for the “mismatch” between my render buffer and Presentation Layer sizes, I want to squash or stretch my left/right and width/height projection matrix parameters. The reason this works is that I’ve “undone” the distortion due to the mismatch between the GLView and the Presentation Layer by exactly compensating for the nonuniform scaling using the projection transformation — I’ve “lied” about where the corners of the canonical view volume are located. Well, this is a lot better than the stretchy square we had originally, but during the transition, our square gets larger, and then progressively smaller. The reason is that halfway through the orientation transition, the Presentation Layer is a square, whose sides are larger than the smaller of the two dimensions at the end of the transition, so of course the rendered square is larger. In spite of the rather lengthy explanation I’ve given, the basic issue with handling OpenGL display during device rotation is simply that the system displays your view’s contents indirectly via a Presentation Layer that changes size/shape during the transition animation. Solving the problem involves compensating, in one way or another, for this behavior. In my (overly) simple sample code, I’ve defined what my scene should look like before, during, and after a device orientation change, and used the projection transform to compensate for the Presentation Layer’s disparity with my render buffer’s proportions.